The iSeries Waterproof Case with Wheels for Blackmagic URSA Mini from SKB is expressly designed to transport and protect your URSA Mini. By accommodating the camera with its shoulder mount attached, using this case saves you precious time otherwise spent removing this oft-used piece when packing for your next move. The case is constructed by fitting a hard-shell case with a foam interior precision-cut to snugly hold the camera, batteries, and various accessories. You can remove the foam divider between the two accessory compartments if one larger space suits your needs. A gasket seal waterproofs the case, and its integrated pressure-equalization valve automatically adjusts to changes in atmospheric pressure. The iSeries Waterproof Case with Wheels for Blackmagic URSA Mini is impact, corrosion, and UV-resistant. Trigger-release latches, padlock loops, and cushioned folding handles ensure secure, comfortable use. 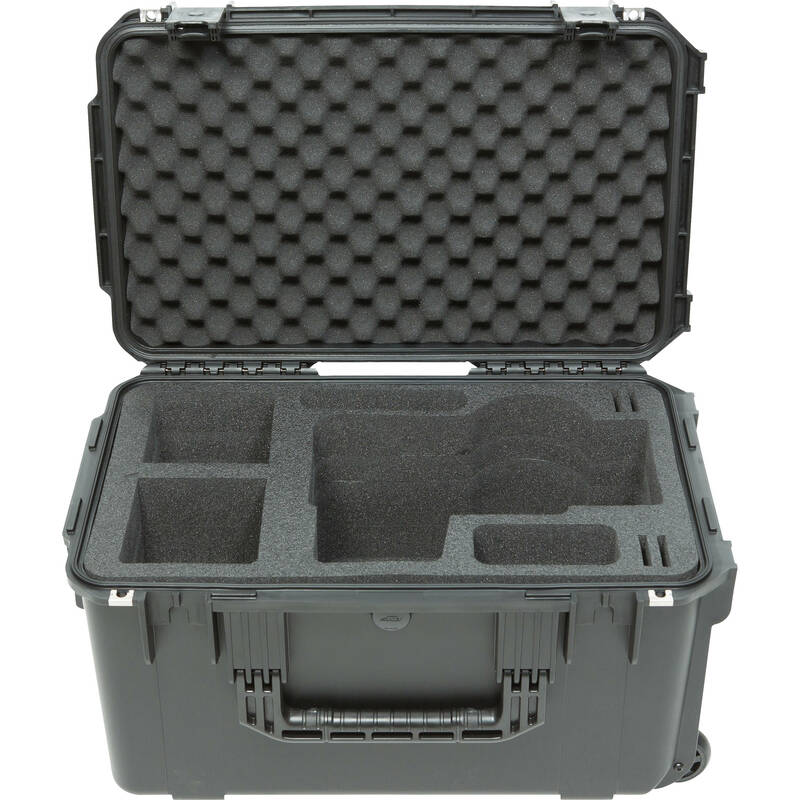 This wheeled case has a retractable pull handle for easy transport while traveling. Box Dimensions (LxWxH) 24.4 x 16.3 x 14.8"
iSeries Waterproof Case with Wheels for Blackmagic URSA Mini is rated 4.0 out of 5 by 4. Rated 5 out of 5 by Jason W. from Awesome case at a great price. We're in Charlotte, NC and needed a case to fly our URSA Mini Pro 4.6k to LA for a job. The camera made it safe and sound to the location and back. We flew with two lenses (Sigma 18-35 and 50-100) in the case in the larger areas to the left. We left the viewfinder attached and it fit perfectly in the case. You can also leave the shoulder mount on and handle on which is nice. Only had to remove the rails. The handle sit nicely on top. The only thing that doesn't fit are batteries. We just put those in the tripod case and were good to go. Highly recommend this case. Rated 5 out of 5 by Brent from Excellent case! I originally picked up the Jason Cases case for my Ursa Mini Pro, but unfortunately it doesn’t actually fit the camera, so I returned it and picked up this one. I’m very happy with this case! Not only does it fir the UMP, but it fits it with the v-mount plate and SSD recorder attached, still leaving room for a battery behind it if you want! You can also leave your top handle attached no problem. Lighter than a Pelican case but seems just as solid. Definitely recommend! Rated 5 out of 5 by Anonymous from This is one solid case! I evaluated a number of cases before getting to this one... I also have a nice Porta-Brace soft case for my BM Ursa Mini Pro but this case is a clear winner. It appears that someone gave some thought to what they wanted to achieve before making this box. My camera fits perfectly, is well protected, and I couldn't be happier. Rated 1 out of 5 by Anonymous from Completely wrong size for URSA mini This case is giant (too big for airplane carry-on) and has no arrangement in which an URSA mini pro in standard sales configuration fits safely. What are the dimensions of the two bigger accessory pockets on the left? 5 inches wide by 10 inches deep, for The SKB iSeries Waterproof Case with Wheels for Blackmagic URSA Mini. Would this camera case hold the Ursa Mini Pro 4.6k with the SSD adapter? Does this case fit in a over head compartment? Does the Ursa Mini Pro fit in this case?